Children love playing outdoors – here’s how to make sure you do too! 50 practical suggestions to help you structure your children’s outdoor play. 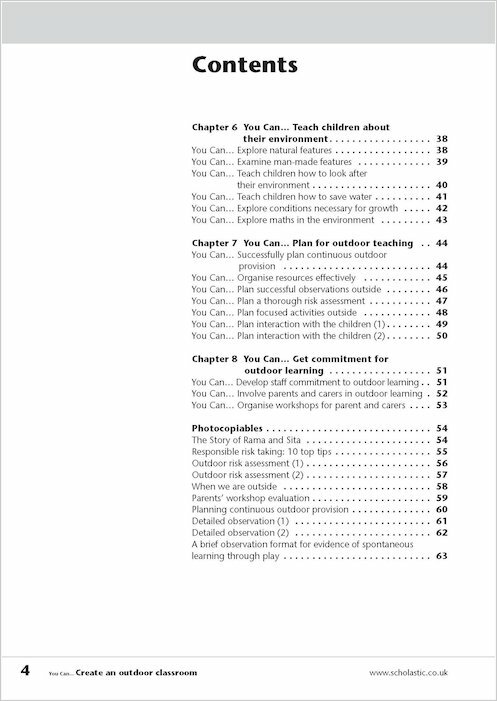 Includes points for reflection, photocopiable pages and handy teaching tips. Covers planning and risk-assessment advice. Includes activity ideas across the Areas of Learning from religious stories to maths activities. 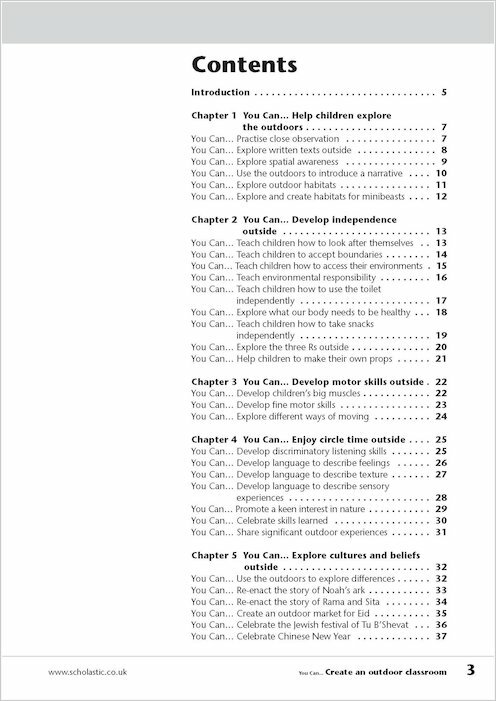 Shows you how to use the outdoor time to encourage independence. Just retired as a nursery teacher and advanced skills teacher for the Foundation stage. 30 years experience as a teacher of 3 – 16 year olds. My specialism in the past was English as an additional language. Involvement with the Swedish Forest Schools and their impact in Japan, Russia, Finland, Latvia on outdoor learning. I write articles for Nursery Education and published my first book ‘Playing Outside, Rain or Shine’in Jan 06. I think that this is a great little book! I’ve been teaching for 16 years across the nursery/primary phases, and will be moving back down to foundation stage next year, so wanted a few ideas for developing outdoor education. Personally speaking, if you enjoy teaching and work in foundation or key stage 1, then I don’t see how this book could fail to inspire you! This book contains loads of ideas for developing all of the aspects of learning outside (which I think is the tricky bit as the tendency is to think outside=physical development). I think that one of the reasons why people might “be reluctant” and “make excuses” for not using the outside area (ref. to KBerry’s review) is that people aren’t sure what to do out there. 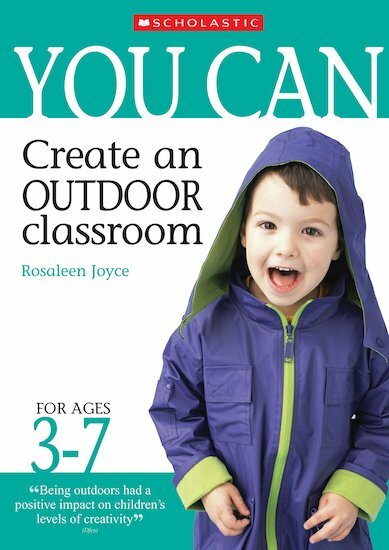 This book would really help to raise people’s confidence and help them see the scope and potential of learning outdoors. The book seems well set out, practical and accessible and I’m really looking forward to using it next year! In fact I’m quite excited about it! This book takes a very different approach to other books on the outdoors that I have read before and makes a refreshing change. I was impressed from the start by the introduction which I felt helped explain the importance of the outdoor environment to reluctant staff. The activities, tips and ideas were well laid out with easy to read bullet points along with thinking points. I liked the thinking points and they did get me thinking- however by the end of the book I felt that many of the thinking points were being repeated. The suggestions in the book were all easy to follow and understand and did not require expensive or elaborate resources or preparation. Although a criticism could be that there was nothing ‘new’ presented here I did feel that the points were all valid and the sort of things that practitioners need to be regularly reminded of. An interesting scope was put on presenting activities. I liked the superheroes theme but felt that this then became a bit repetitive. I feared it could also encourage aggressive play, but having said that whenever a superhero approach was suggested, there were always suggestion on applying rules and boundaries to stop play getting out of hand. All aspects of the curriculum are covered from the typical social and physical to maths and language opportunities, proving just how much the outdoor area can offer. It also considered all the practical issues of using the outside- group size, safety, observations, rules and boundaries, SEN, i.e. many of the ‘excuses’ typically offered as to why the outside area cannot be used. I particularly enjoyed the chapters on developing independence & involving the children and planning for the outside area. The book was different to many other practical early years’ books in that it did not set out precise activities and there was no reference to stepping stones or early learning goals. Not all ideas were linked specifically to the outdoor area which I initially found a little strange, but on reflection I realised this helped show how the outdoor area should be seen as an extension of the indoor area- for example, snack times can be outside. The book does provide ideas for the age range it is aimed at (3-7 yrs). Good links are provided to help develop points further- books, websites, teachers TV programmes. To improve the book I would like to see a few precise activity ideas and I would also like more mention to be made of the challenges faced by setting with only a very small outdoor area. To conclude- this book is good for outdoor inspiration but also as a general read for reminders to staff of all round good practises. It has not however left me with any set ideas of an activity I would like to do outside. Rather it relies on the reader being inspired and developing the ideas presented in the book. Therefore it is best suited to proactive, reflective practitioners and not as a quick dip in book for activity ideas. It would also be a good book for students.